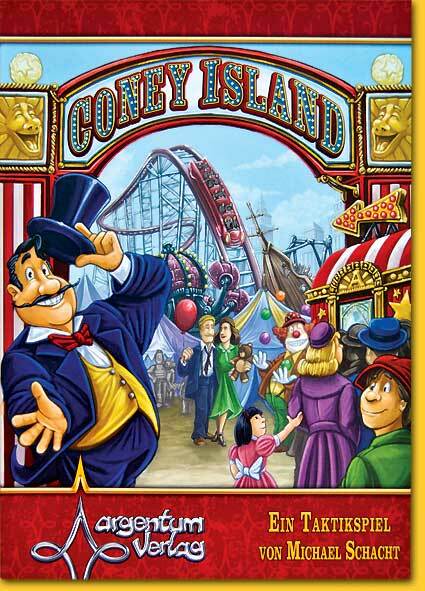 In ‘Coney Island’ players are going to build the amusement park with the same name to its old splendor. Each player represents a family who is going to contribute as good as possible. The amount of attraction -points- that is achieved with this contribution determines which family will win; obviously the family with the most points wins at the end of the game. ‘Coney Island’ is just a piece of wasteland at the beginning of the game, represented by the central game board with 24 building sites. Before the players can build on these sites, they have to be made ready for building by placing building site tiles. Four of these tiles, from a total of twelve, are randomly drawn and placed in the center of the board at the beginning of a game. 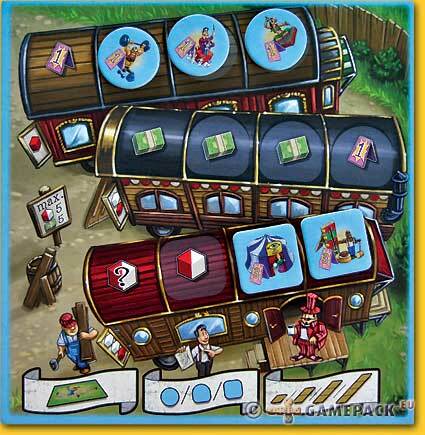 Each player receives his own player board that shows three caravans. 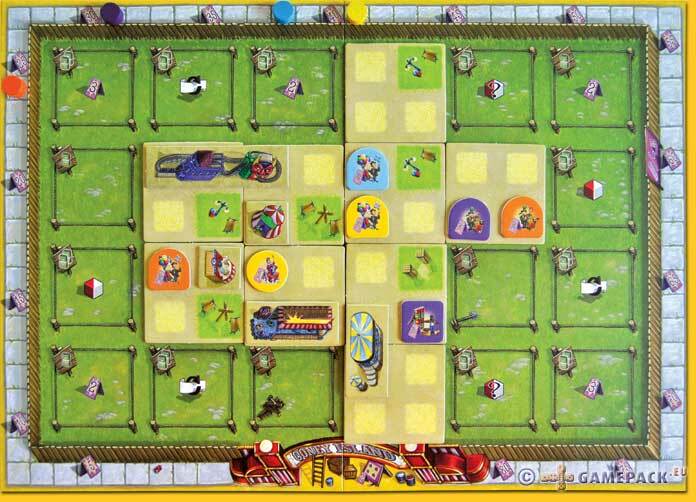 Each caravan houses three showmen, represented by tiles in the player’s color and in the shape that corresponds to the upper, middle or lower caravan. Also each player receives a starting capital of two money tiles and one random building material, a red or white cube that is randomly drawn from a bag. 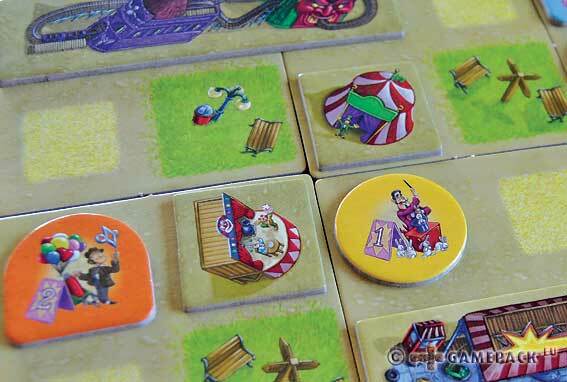 The grand attractions that can be built are placed in stacks next to the game board, just as the remaining building tiles. A player’s turn consists of two phases: an income phase and an action phase. 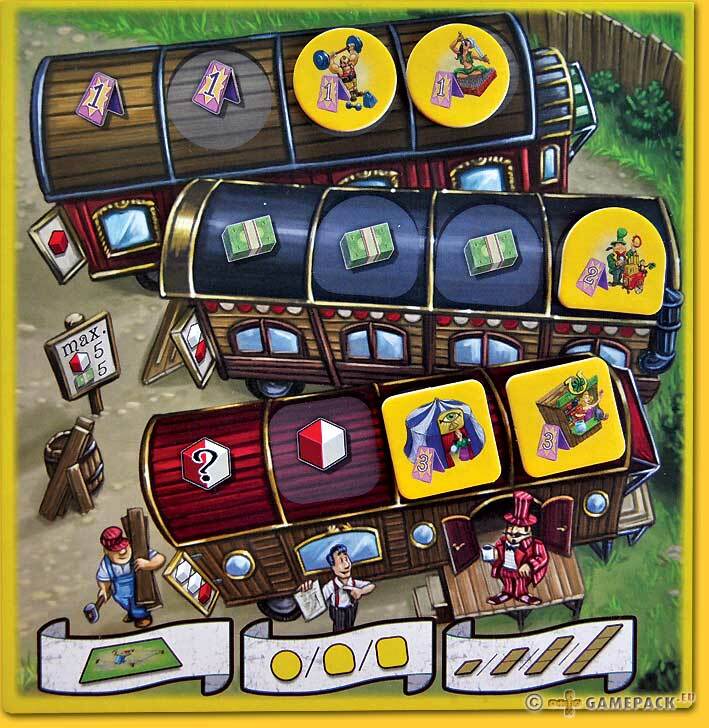 In the income phase a player receives income from each of his three caravans. The amount of income depends on how many of the showmen have been placed on the central game board (sent out for work). However, each caravan always generates some income. The sort of income depends on the caravan: the upper one generates point, the middle one money, and the lower one building material. 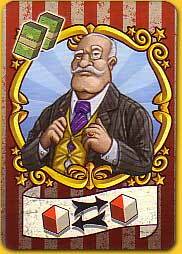 Hoarding up is not possible: a player cannot have more than 5 money or cubes. When a player receives more, he has hand in the surplus. The income can be spent during the action phase. Three main actions are there to choose from, and five possible minor actions, which are represented by character tiles. All eight of these actions can be taken, but a single action can only be taken once. One possible main action is placing a building site tile on the game board. This costs money, and it can give points or building cubes, and in any case extends the building space on the game board. A second main action is placing a showman tile from a caravan to the game board, on a free spot on a building site tile. The costs for this depend on the caravan, but is at least one red cube and one white cube. As a third possible main action a real, grand attraction tile can be built. This tile replaces a number of showmen tiles, which are returned to their owner(s), not necessarily the active player. On each attraction tile is indicated what the building cost in cubes is, the number of colors the showmen tiles must have, and an amount of points that is given to the player who built the attraction. The players whose showmen have been replaced get points as well: 1, 2 or 3 points, depending on the caravan. 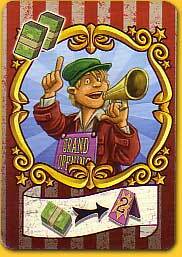 Note that this action results in a reduction of income in the next turn for the players involved. The minor actions are possible by either owning or obtaining the corresponding character tiles. 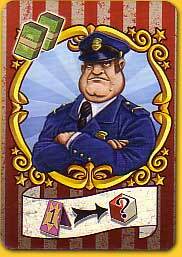 Character tiles are obtained by ‘bribing’ the character: pay two money to the bank, and his services are yours. When a character is in your possession already, this money does not have to be paid again. The services are all very nice to have, like changing the color of a cube, as most of the time they are randomly drawn, exchanging money for points, or buying a newspaper. These newspapers are worth points at the end of the game: 2 or 3 points at the beginning for pink newspapers, and 1 or 2 points later in the game for white newspapers. A newspaper can also be discarded, which gives the opportunity to perform the same action a second time. The players play turn after turn until one of the four end conditions is fulfilled: a player has received the 60 points mark, a limit is reached on the number of available building sites, the stack of newspapers is empty, or of all types of grand attraction tiles only a single one is left. The current round is completed, after which a final scoring takes place. For each showman still on the central game board a player loses two points. Then the newspaper points are revealed and counted, and then the winner is known: the player with the most points. ‘RollerCoaster Tycoon  The Boardgame’. That is about the initial thought that comes up when first seeing this game. And it sounds like fun: building together to build an amusement park, and make it a big success. In practice, this turns out a little different. Certainly, ‘Coney Island’ has some nice elements. A player always receives something during the income phase, and this makes for a very friendly game. The 2 and 3 player variants are very good playable, and these variants are very well explained in the rules. The building of the grand attractions, the featured amusement park, is just one way to score points, and certainly not one of the most obvious ones. Other scoring options are clearly there, and the first couple of games it quite diffuse what the best way forward is. Clearly, the different caravans suggest different tactics. Placing the upper caravan showmen on the board will lead to a quick scoring advantage. Building grand attractions is a more difficult approach: it takes longer and raises the questions which showmen to replace: a player’s own own, scoring points, but reducing his income, or other player’s, with the same mentioned effect for these players? Planning and good timing are pretty important for a good result, and it is here that ‘Coney Island’ is not really the building game which is suggested by the theme and name. In fact it is tough resource management, with the obvious scarce resources that go with this. Another factor is that some character tiles are so powerful, that they cannot be left to the same person for a long period. 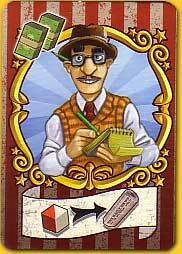 As an example, the journalist typically gives a player 2 to 3 points for each newspaper each turn, so this character needs to be taken away from a player after a few turns. Also, a quick, big lead by a player who has sent his upper caravan showmen to the board may require a counter action by building a grand attraction over these showmen. For some players this is not the kind of actions they prefer or like to perform during a board game. Furthermore, it requires quite a few games to evaluate or try possible tactics, and, well, the game is just not enough fun for this. 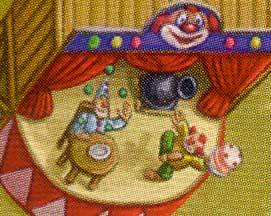 The presentation of the game does not really contribute to a nice, fun, or amusement park atmosphere. The game starts with an empty piece of wasteland, and it ends with a half-full piece of wasteland. The grand attractions -albeit nicely drawn- are far too small to make any impression of an attraction. With a lot of games there is an aftermath in which players oversee the board and discuss various actions or just admire the joint construction. In ‘Coney Island’ this is really not the case, whatever there was built is a bit fuzzy, but for one thing can’t be associated with the atmosphere in an amusement park. Oh, with a magnifying glass it becomes clear: no really, this is funny! A pie! He throws a pie!